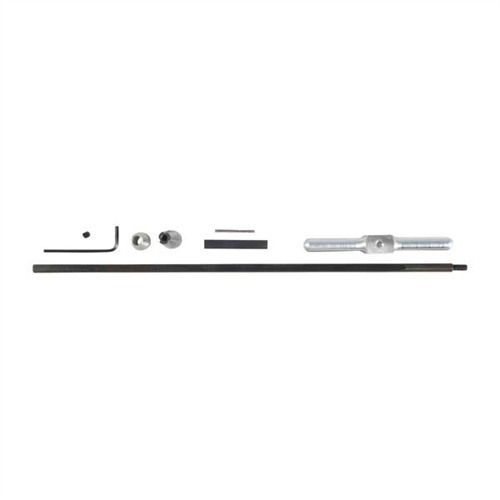 The BASIC KIT consists of Handle, Tool Extension Rod, Centering Guide, one 5°, 11° or 18° Chamfer Cutter, a cutter removing Breaker Bar, 3/32" Allen Wrench and the Kit Box. BASIC KIT består av håndtak, verktøyet utvidelse stangen, sentrering Guide, en 5°, 11° eller 18° skråkanten Cutter, en kutter fjerne bryterstangen, 3/32" Allen fastnøkkel og boksen Kit. The front bushing that goes in the barrel by the forcing cone, should be included. To make an accurate cut, the brass forcing con bushing and chamfer depth guage should also be purchased. I'm a single action shooter and own several, so I bought this tool so I could do my own forcing cones. So far I've used it on .357, .44 Special and 45 Colt revolvers. The tool has worked perfectly every time and it's use has drastically improved the accuracy of some of the revolvers. 11° .38-.45 Caliber BASIC KIT består av håndtak, verktøyet utvidelse stangen, sentrering Guide, en 5°, 11° eller 18° skråkanten Cutter, en kutter fjerne bryterstangen, 3/32" Allen fastnøkkel og boksen Kit.